It doesn’t look like the ownership of the .com has changed since at least January 2013. The Complainant was filed by Efzed Pty Ltd. Mr. Frank Zimmermann Simulate Pty Ltd. which owns the domain name Airlineonline.aero as well as simulate.aero. For the record the domain name airlineonline.aero doesn’t resolve to a site but tells people to visit the company on simulate.aero. Lets hope for a Reverse Domain Name Hijacking on this one. According to the news from Domain.cn on January 30th,Appfield.net is a German technology services provider that is rolling out a new product, Discard.email. The product is a disposable email service that will let users use their own domain name if they wish. Of course it is hard business out there competing with the likes of Gmail and Yahoo. The service claims to be better at fighting spam and providing other features. “Users can use their own unused domains privately and anonymously on our email service. If someone wishes to provide a domain publicly for enabling other users to use it, he or she gets a unique opportunity to publish a banner advertisement. Blacklisting or blocking of domains is now a thing of the past and users can now shoot as many emails s they wish anonymously and reach out to thousands of customers, employees, friends and casual acquaintances. Users can now just fill up a small form to get started”, claimed the owner of Discard.email during a recent press conference held at Chemnitz in Germany. “Our spam blocking and prevention technique is one of the best at this moment”, claimed another co-owner. Bearing the legacy of Spambog.com, another hugely popular disposable email service that has now rebranded as Discard.email, the new email service promises to become a powerful emailing tool for business and regular users. The owners have reiterated that they have successfully kept off cyber security issues and that their email service has all the potentials to become an alternative to leading email clients. The email service can be used on all devices, including device computers, Smartphone and tablets. However, the most striking feature of the new email service, as Discard.email developers have claimed, is the “Use Own Domain” service which comes as a plus with the email service. According to the news from Domain.cn on January 29th,the RightoftheDot.com extended auction from the Namescon conference is ongoing on Snapnames.com and ends on February 5th which is a week from tomorrow. Auctions which is certainly one of the most valuable domain names in the extended auction has a value of $1,170,000 which is low since the singular domain name auction.com sold for $1.7 million back in 2009. Photographers.com which might be the best buy on the board has a value of almost $500,000 while the reserve range would indicate the sales price might be around 50% of that. Want Your Baby To Have A Unique Name ? Do you have an extra $31,000 lying around to pay for it ? According to the news from Domain.cn on January 29th,Huffington Post did a story on Erfolgwelle a firm that focuses on giving your baby a unique name. They do all this for $31,000. The article lays out the process and who they bring to the table as far as their staff. Erfolgswelle is firm devoted entirely to generating unique baby names. With 14 naming experts, four historians, and 12 translators on hand — not to mention two trademark attorneys to ensure names don’t conflict with companies and products — the staff at Erfolgswelle will spend around 100 hours per client coming up with 15-25 possible names. For about $31,000, that is. If clients don’t like the the first round of choices, Erfolgswelle staff will reportedly come up with 10-15 more. According to the news from Domain.cn on January 29th,Good Technology Corporation and Good Technology Software, Inc. (collectively, “Good”) which operates Good.com, filed a federal lawsuit against Good.Co, Inc. in the United States District Court for the Northern District of California yesterday for trademark infringement and volition of the ACPA. Since August 2001, Good continuously has used the GOOD Marks to identify its products, including application software. Good uses the GOOD Marks throughout the United States on and in connection with its products and services including in advertising and other promotional materials and on its website www.good.com. \According to the news from Domain.cn on January 28th,6 new top level domain names will be released on Wednesday. A number of new top level domain names are being launched in general availability this week, all on Wednesday. BusinessRalliart releases the geo domain name .ryukyu, which is related to Okinawa. Expect to pay about $15 for domains in this extension. Rightside releases two domain names: .band and .rip. I’m more bullish on .band, but I’m also interested in seeing the types of domains that are registered in .rip. Will they end up being mostly celebrity tribute sites? .Band domain names will cost you about $25-$30 retail, while .Rip domains are about $5 cheaper. Here’s an interesting Chinese IDN: Chinese for “I Love You”, .我爱你. According to the news from Domain.cn on January 28th,it was just 8 hours ago when we posted the Godaddy Super Bowl Ad known as the #Godaddypuppy which went tragically wrong. Now the CEO of Godaddy has given in to the overwhelming condemnation of the ad and announced the commercial will not air during the Super Bowl. Had they reached out to anyone in the industry before hand like myself, we would have told them there we;re heading down the wrong path, but after investing what is probably million of dollars towards this campaign GoDaddy wisely followed our advice and pulled the ad. Its still an issue for me that executives at Godaddy green lighted the ad and somehow thought it was a good idea. However, for now it appears that the internet, social media, Twitter and the hearts of America have won the day and Godaddy made the decision to take its lumps and call it a day, burn the film as we recommended earlier today and go with something else. Our Yorkie’s Romeo and Juliet are very happy. According to the news from Domain .cn on January 27th,Joseph Peterson explores the problem of shill bidding at Flippa. Are you paying more than you should to buy a domain name at auction? That might be the case at some online venues. Throughout 2014, it was possible to purchase fake bids and endorsements for Flippa auctions from a website explicitly offering shill services for sale in broad daylight. Even those of us familiar with the practice of buddy bidding, perhaps concerned about employee participation in auctions, or who have suspected that more formal shill bidding networks operate behind the scenes should be surprised by just how brazen these folks were … and by how long they have been able to get away with it. That site was FlippaBid.com. At some point between December 16 (when I first learned of FlippaBid.com) and December 19 (when I pitched this article to Andrew Allemann), that website went missing. Possibly, someone finally complained and got them shut down. I say “finally” because DomainTools.com has preserved a revealing screen shot from March 17, a full 9 months earlier. Click here to see FlippaBid.com in action. You’ll see a website with better graphic design than many legitimate businesses can boast of, suggesting that this was a commercially viable operation for 9 months. My hunch is that they began placing fake bids and comments at Flippa before they thought of formalizing their services with a website. In fact, their site claimed that they had been providing “bidding services” for 3 years, which would date their inception somewhere in the vicinity of March, 2011 … roughly 4 years ago. $5 was enough to buy a fake bid below reserve. 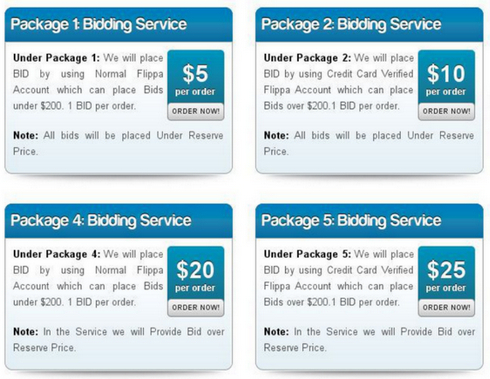 $10 would get you bogus bids above $200, placed using a Flippa account verified by credit card. If you wanted to provoke a bidding war above the reserve, then bids cost $20 – $25 (depending on desired bidder credentials). Rounding out its menu of 6 service “packages”, FlippaBid.com offered endorsements in the comments section below your Flippa listing. Not only did FlippaBid.com offer refunds in the event that one of its shill bidders was banned or suspended; they laced their website with testimonials and were set up to accept multiple payment options for your convenience. 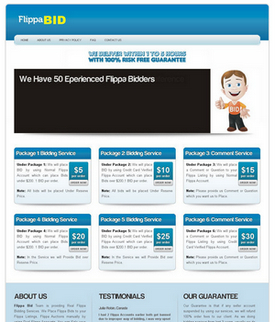 While FlippaBid.com went the extra step of creating a website for its service, others have offered bidding services on sites like Fiverr. That’s important. And commendable, as far is goes. To be absolutely clear, shill bidding “is strictly forbidden on Flippa“. Yet when Flippa does close down an account due to abuse, the company is unlikely to shine a spotlight on past fraudulent bids – bids that may have inflated purchase prices and which certainly diminished the visibility of concurrent, legitimate, paid-for listings. As long as suspicious cases are quietly reported to Flippa management and (at best) quietly shut down, the larger issue of ongoing shill bidding remains unaddressed. Why does Flippa attract shill bidders, “buddy bidding”, and potentially fake comments? Unlike most domain auction platforms, Flippa charges a base listing fee and pushes customers toward upgrades costing as much as $349 per auction. Standard Flippa listings have literally shrunk so that these days they’re harder to spot on the screen! Flippa gives out these $349 upgrades to some sellers at no cost and frequently includes their listings in promotional emails; so there’s considerable extra pressure to compete for visibility. That leaves sellers with two options for boosting on-site exposure: expensive upgrades or bids. Since buyers have an incentive to wait until the last moment, sniping auctions or negotiating after they’ve ended poorly, even attractive listings may not receive bids until the opportunity for extra exposure has passed. Therefore, soliciting bids from friends or even buying them is a tempting proposition. Going the legitimate route, $49 would buy a Flippa customer a few hours of exposure as a “Home Page Listing” until their domain is knocked off by the next person paying. But a mere $5 spent at FlippaBid.com would have bought a $200 bid, visible to everyone for a full 30 days and archived as a permanent sign of “buyer” interest. That same $50 could have bought 10 bids from 10 unique bidders, all the way up to $200. Or else 5 bids from 5 distinct bidders up to any amount your heart desires – say $266,000! At the moment I’m writing this, only 8 auctions at Flippa have 20 or more bids. That means $100 spent at FlippaBid.com would be sufficient to keep your listing in the top 8 auctions for a full month. Why pay $349 for Flippa upgrades (e.g. a logo or a single tweet) when that same $349 can buy enough bids to keep your listing at the very top of the “Most Active” pile for 30 days? To be fair to Flippa, the company has taken some steps to improve marketplace transparency. For example, you can see how much a bidder has transacted through the platform; and Flippa also marks commenters as banned if they are ever removed from the system. Still, without bidder aliases and an archive of past results, it’s hard to connect the dots. Verification remains weak. Only a phone verification is required to place comments (which can be easily achieved with a Google Voice number). A credit card pre-authorization is required to bid above $200. Such credit card verifications don’t stop shills. GoDaddy Auctions recently essentially admitted that such verifications aren’t enough and added additional verification requirements to place meaningful bids. One big step Flippa could take is to assign bidder aliases to each bidder, much like NameJet does. The sad truth is that marketplaces benefit from shills. Fake bids inflate final sale prices. Fake bids give the impression of bustling activity and insatiable buyer demand, leading to more revenue from seller listing fees for any site that steers sellers toward lucrative upgrades. In both respects, fake bids drive profits. Until public pressure builds up to the point that the cost of neglecting shill bidding outweighs the benefits of allowing it, no auction platform has much motivation to invest resources in quashing its own bids. We might be getting near that tipping point, and not just at Flippa. DNW: When did Flippa become aware of FlippaBid.com and what actions did it take to shut it down? Fink: Due to the legal component involved in the shutdown of FlippaBid, I’m unable to comment further than to simply say — Our team cracks down on these individuals and sites, on the daily, including sellers on gig-related sites that push this kind of service. It hurts everyone involved, and we’re keen on hammering out ways we can eradicate this sort of behavior entirely. Is it possible? I’m not sure; otherwise an auction space would have figured it out by now, but I will address what we are going to do about this — and other verification / security measures — in this space, and in future posts to come. DNW: Do you believe that the way Flippa highlights “popular” domains or sites incents people to request friends/others to place below reserve bids or post comments? Fink: No more or less than any other outlet. All auctions are subject to this kind of behavior, and everywhere you look. What matters most to me and my day-to-day, is how we’re handling it on our end and what more we can do. How can Flippa become the most secure and trusted auction-based marketplace? We’ve made great strides; I do appreciate Joseph acknowledging that things have improved, and rightfully so. While this doesn’t dissuade our detractors and skeptics, the focus is now on upcoming changes we are aiming to implement en route to further fighting and hopefully eradicating this kind of behavior entirely. DNW: What concrete steps has Flippa taken to cut down on shill bidding and fake comments? Fink: As for fake comments, we’ve implemented a system that not only mutes these (so only sellers’ comments are broadcast out via email), but we are fairly active in warning, suspending and – yes – banning those that blanket self promotional comments across listings. I have personally witnessed this activity, in particular, drop tremendously. We’ve also seen erroneous bids and deadbeat buyers dwindle considerably, and have been able to spot more duplicate accounts (and potential or actual shill bidders) than ever before throughout Flippa’s history. This is a joint-effort between our Marketplace Integrity and Customer Success departments, as well as automated checks in place to find and root-out fake accounts, fake bidders and fake buyers. We spot the vast majority of erroneous activity through this coordinated effort, and rely on eyeballs of the rest of our staff and active members of our community to report suspicious behavior, which we investigate and act upon individually. DNW: Has Flippa considered showing bidder aliases rather than “bidder 1″ and “bidder 2″ as a way to cut down on shill bidding? Fink: First, yes — bidder aliases are something I feel would make tremendous sense to implement. We’re also crafting some major improvements to bidder / buyer verification; more information to follow, but I would like to see these shifts rollout altogether. I do want to state one thing about our current bidding structure, in that there’s a massive misconception that — let’s use “Bidder 1″ as an example — subsequent bids from this bidder are considered shill bidding. Rather, this could be a couple of things that often are not spoken of: first, it could be a legitimate buyer testing the reserve range. Second, it could be an automatically “upped” bid due to the high bidder’s proxy, and the way by which our system displays the order of bids. I appreciate Andrew including me in this dialogue, and the opportunity we have — with our members and the audience reading this — to continually improve our marketplace. Please be in contact with us at any time to offer feedback, suggestions or product requests. According to the news from Domain.cn on January 27th, b Booked Ltd of London which owns the domain Booked.xyz and Bookedxyz.com was just found guilty of Reverse Domain Name Hijacking on the domain name Booked.com in one of the most baseless UDRP cases we have ever read. Its too bad there is not any penalties for those who bring frivolous UDRP cases other than a finding of Reverse Domain Name hijacking which the three member panel rightfully found. The domain owner represented himself in the UDRP which is just silly on its face. The domain Booked.com was registered on January 7, 1999. The Complainant was incorporated on July 15, 2014 as an English registered limited company and registered the domain names booked.xyz and bookedxyz.com. It owns a UK registered trademark in respect of the terms “booked.xyz” and “booked.com”, registration number UK 00003064753 registered (as a series) on October 24, 2014. I have no idea how country granted a trademark to a domain that wasn’t owned by the applicant but what can I tell you. Its a totally baseless case in fact or in law, and its a shame that a domain holder had to spend time to answer such a silly case and that a three member panel of Nick J. Gardner, Christopher S. Gibson and Tony Willoughby had to waste their time on it either. The Complainant has established that it has a registered trademark in respect of the terms “booked.com” and “booked.xyz”. The dominant part of each of these terms is the word “booked” and the Panel concludes in these circumstances that the Disputed Domain Name is identical or confusingly similar to the Complainant’s trademark. As a general rule the registration of domain names is a “first come first served” system. In this particular case the Panel concludes that the Respondent was perfectly entitled to register this ordinary English word given no antecedent trademark rights are alleged to have existed at the time of registration. “Panels have generally recognized that use of a domain name to post parking and landing pages or PPC links may be permissible in some circumstances, but would not of itself confer rights or legitimate interests arising from a ‘bona fide offering of goods or services’ ….or from ‘legitimate noncommercial or fair use’ of the domain name, especially where resulting in a connection to goods or services competitive with those of the rights holder. As an example of such permissible use, where domain names consisting of dictionary or common words or phrases support posted PPC links genuinely related to the generic meaning of the domain name at issue, this may be permissible and indeed consistent with recognized sources of rights or legitimate interests under the UDRP, provided there is no capitalization on trademark value (a result that PPC page operators can achieve by suppressing PPC advertising related to the trademark value of the word or phrase). The Complainant’s case in relation to this element appears to be that because the Respondent has no registered trademarks corresponding to the Disputed Domain Name he has no rights or legitimate interests. That argument is simply wrong. There is no requirement upon domain name registrants to themselves have registered trademark rights in order to establish a legitimate interest. The Complainant also says that the Respondent’s actions infringe its trademark. That is not a matter for this Panel to determine, although it can anticipate numerous arguments the Respondent would deploy in disputing that allegation. The Panel also notes that the Complainant has applied for and obtained a registered trademark which corresponds to a domain name it must have known was owned by a third party. It would in the Panel’s view be surprising if having done so the Complainant could then use that trademark to seek to impugn the registration and use of the Disputed Domain Name. In the circumstances the Panel attaches no significance to this unsupported assertion by the Complainant. The Complainant also says that the Respondent’s use of the Disputed Domain Name is a “waste of resources”. The fact of the matter is that the Disputed Domain Name was legitimately registered by the Respondent and it is, in general, his resource to do with as he wishes. Based on the circumstances of this case, the Panel decides that where the Disputed Domain Name (i) predates the existence of the Complainant’s trademark by 15 years, and (ii) is comprised of a dictionary word used for PPC links related to the generic meaning of that word, the Respondent has established a legitimate equitable seniority interest in the Disputed Domain Name. The Panel has no hesitation in concluding that the Respondent’s registration was not in bad faith. The Respondent was entitled to register the Disputed Domain Name containing an ordinary English word on a “first come first served” basis in circumstances where no question of any prior third party rights in that word existed. The Panel also concludes that the Respondent’s subsequent use, both in relation to a parking page with PPC links and in offering the Disputed Domain Name for sale, were not in bad faith. In this regard the Panel considers that the various arguments asserted by the Complainant are all wholly misconceived. The Complainant has come into existence many years after the Disputed Domain Name was registered. On the evidence before the Panel this is not the type of case where the Complainant then carries on business under a name the same as or similar to a pre-existing domain name in a manner which develops significant reputation of its own in the name and where, as a result, questions may arise as to whether a respondent’s continuing use of the domain name in question (especially if the respondent changes in some manner that use) then amounts to bad faith use. In the present case no evidence at all is before the Panel about the Complainant’s business. Somewhat extraordinarily the Complainant has not felt it necessary to place evidence before the Panel as to whether it has ever traded, whether it has a website, whether it has ever advertised or promoted whatever business it may have, whether it has even a single customer or whether it has ever earned any revenue. In the view of the Panel this is a Complaint which should never have been launched. The Complainant knew that the Disputed Domain Name was registered some 15 years before the Complainant came into existence. No attempt was made to demonstrate the existence of any earlier rights or to address the issue arising from the obvious fact that the Respondent had simply registered a dictionary word long before the Complainant even existed. The submissions made by the Complainant were simply assertions that the actions of the Respondent, in offering the Disputed Domain Name for sale and in using the Disputed Domain Name in respect of a PPC webpage, somehow resulted in the Respondent registering and using the Disputed Domain Name in bad faith. Further the Complainant has obtained a registered trademark which it must have known corresponded to the pre-existing Disputed Domain Name and then sought to argue that this trademark somehow retrospectively rendered the Respondent’s registration and use of the Disputed Domain Name as being in bad faith. Given the nature of the Policy and previously decided cases on this issue, this was an argument that had no reasonable prospects of success in the circumstances of this case. Any sensible reading of the relevant issues as set out in WIPO Overview 2.0 should have led to that conclusion. The Panel accepts that the Complainant and its officers are not experts in the UDRP process but at least one of those officers is a qualified attorney and it is clear to the Panel that considerable thought and effort have been devoted by the Complainant to preparing its Complaint. That should have resulted in the Complainant appreciating that it was commencing a proceeding that had no reasonable prospect of success. The Respondent should not have been put to the time, trouble and cost of having to defend this Complaint. The Panel agrees with the Respondent that the present case is very similar to Squirrels LLC v. Giorgio Uzonian, WIPO Case No. D2014-1434, a three-member panel decision, where the panel concluded that the case should never have been brought and constituted RDNH. The present Panel applies the same reasoning to the present case. According to the news from Domain.cn on January 27th, Fotocom Société Anonyme of Ottignies-Louvain-la-Neuve, Belgium, just lost its bid to grab the generic domain Photo.com. Although the three member panel threw out the case out finding the Complainant failed on the first element of not proving trademark rights the panel refused to find Reverse Domain Name Hijacking (RDNH). Based in Belgium, Complainant describes itself as “a market leader in the online digital photo industry,” serving 186 countries. Complainant holds registered Benelux trademark no. 833326 for FOTOCOM and registered Community trademark no. 10500726 for FOTO.COM. Complainant contends that Respondent is actually controlled or influenced by its former Chief Executive Officer (hereinafter “Panos”). It is further alleged that in 2010, Panos, in his position as CEO, hired a United Kingdom law firm to pursue the acquisition the Domain Name from a domain broker. Complainant alleges that Panos was actually secretly bidding against his own company and that, in February 2010, the Domain Name was sold for USD 1,250,000 to a company, xxlpix Limited, controlled by Panos. According to the e-mail, as alleged by Complainant, the Domain Name had resolved to a parking page for two years but motiondrive AG plans to launch a website using the Domain Name. In the meantime, the e‑mail allegedly states, motiondrive AG had concluded an agreement to rent the Domain Name to a third party for three months. Complainant alleges that, notwithstanding his e-mail, “it is obvious that Mr. Krachtus is not the real registrant” of the Domain Name. On October 22, 2014, Complainant sent a letter to Mr. Krachtus which “gave him the opportunity to demonstrate his good faith.” The letter contained a host of questions and requests for documents, including the alleged rental agreement, proof of payment by motiondrive AG to the Domain Name seller, and a copy of the parking agreement. Complainant alleges that Mr. Krachtus refused to provide the requested information and documents. According to Complainant, the Domain Name currently resolves to a parking website which provides hyperlinks to third-party websites offering goods in direct competition with Complainant. Respondent owns Community trademark 5009089 for PHOTOBANK, registered in July 2007. Respondent contends that its PHOTOBOOK computer system “processes up to 10,000 customer orders for photo books and photo-related products per day.” Its turnover from such activities has surpassed EUR 1,500,000 annually since 2009. Respondent also owns Community trademarks PHOTOFRAME, PHOTOMEMORY, and MYPHOTOBOOK, registered in September 2006, September 2007, and February 2013, respectively. Respondent’s CEO Krachtus is also CEO of Fomanu AG, which company operates a website at (translated from the German as “photo book” in English) where consumers may order photo books, calendars, and related software. According to Respondent, it purchased the Domain Name for more than EUR 1,000,000 on September 4, 2012, and confirmation that the Domain Name was registered to Respondent was provided on September 11, 2012. Respondent CEO Krachtus swears in an affidavit that he had no knowledge of Panos, and that he and Respondent dealt exclusively with intermediary DomainHoldings, which acted on behalf of the undisclosed prior owner of the Domain Name. Respondent claims that it registered the Domain Name because of its perceived value as a platform for Respondent’s various products, including photo books, photo calendars, photo mugs, and the like. Respondent asserts that it is in the process of developing a comprehensive website, rather than releasing a website on a piecemeal basis, for its various photo-related offerings. Respondent annexed to its Response various invoices from IT consultants to Respondent in 2013 and 2014. In the meantime, Respondent states, it has parked the Domain Name at a site which derives pay-per-click (“PPC”) revenues on the strength of the popular generic word “photo”. Respondent adds that it had sought to enter into a three-month lease of the Domain Name with a third party while the website was being developed, but the lease negotiations have borne no fruit to date. The Panel unanimously finds that Respondent has a legitimate interest in the Domain Name. There is evidence in the record that Respondent, a viable company for several years and the holder of several trademarks containing the word “PHOTO,” purchased the Domain Name for more than EUR 1,000,000 in September 2012, and there is record evidence of Respondent’s efforts to set up a comprehensive website in aid of its sundry photo-related commercial activities. he Panel therefore concludes that Respondent enjoys rights or legitimate interests squarely within the meaning of Policy paragraph 4©(i). Accordingly, Complainant has failed to satisfy Policy paragraph 4(a)(ii) and this Complaint must therefore be denied. The Panel need not do so, but would also find Complainant to have failed to prove bad faith registration and use for essentially the same reasons as were articulated above under the “Rights or Legitimate Interests” head. The Panel notes finally that this Complaint was ill-suited for resolution under the Policy, which is designed to address clear cases of cybersquatting. Having said that, the Panel is not inclined to declare Complainant guilty of Reverse Domain Name Hijacking.